Just look at this photo. On the highest mountain in North America, surrounded by stunning snowy scenery and beneath a sun halo, sits a 50-year-old tandem rotor heavy lift helicopter equipped with ski landing gear. 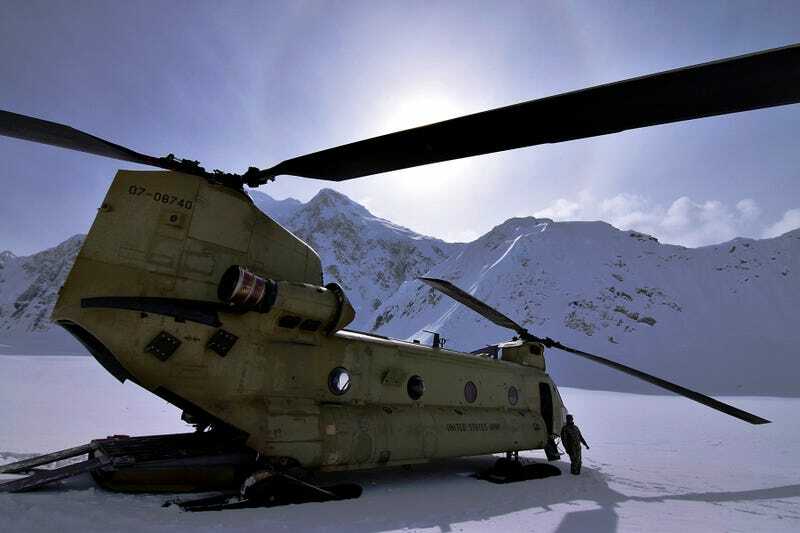 An aviator from D Company, 1st Battalion, 52nd Aviation Regiment stands outside a CH-47F Chinook helicopter at the Kahiltna Glacier base camp on Mount McKinley in the shadow of 13,965-foot Mount Hunter April 27, 2015. Soldiers and Chinooks from the D/1-52d “Sugar Bears” made short work of delivering several thousand pounds of equipment to base camps at 7,000 and 14,000 feet for the 2015 climbing season, saving money and time for the National Park Service and gaining invaluable experience operating at altitudes and in terrain not available for training missions outside Alaska.